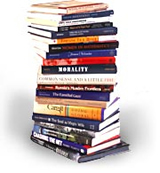 Through the years there are titles, ranging from Getting to Yes to Predictably Irrational to 7 Habits of Highly Effective People, which our readers return to time and again. Now with our new Kindle Project, we’ve made these titles available as a takeaway library. These classics, available April 25th, are sure to be popular with our traveling patrons. Make sure to check yours out now and enjoy the classics with the Ford Library. It is time to sing Goodbye, Farewell, Auf Wiedersehen, Adieu to our graduating students and to wish them much success wherever life takes them. Students bring energy and excitement to our life at the university, and so it is with mixed feelings that we say Goodbye. As a farewell gift to our students, here are short reviews of two new books that focus on getting the most out of life. Fox, Elaine. ﻿Rainy brain, sunny brain : how to retrain your brain to overcome pessimism and achieve a more positive outlook. ﻿Basic Books, 2012. ﻿This tour of recent research in brain science concludes that optimists generally have better health and wellbeing; are more emotionally resilient; and experience greater success in life. While a typical self-help book attributes optimism to a positive mindset, brain scientist Elaine Fox explains that optimists’ better lives result from something more than attitude. Those with sunny brains are primed to undertake beneficial actions to achieve the things they want. Optimists stay focused on their goals in spite of setbacks. More than having the right mindset, optimistic people are fully engaged in life. Fox explains that is possible to train your brain to be more optimistic. Human brains are flexible and can be reshaped throughout life through changes in cognition. People who are fearful and anxious can learn to regulate their emotions by reinterpreting distressing thoughts. Fear can be also controlled through techniques using language or focused attention. Fox shows that to thrive, people need to experience positive emotions in their lives every day. People who get the most out of life have at least 3 positive emotions for every negative. These positive experiences include compassion, contentment, gratitude, hope, joy and love. Tan, Chade-Meng. Search inside yourself : The unexpected path to achieving success, happiness (and world peace). HarperOne, 2012. 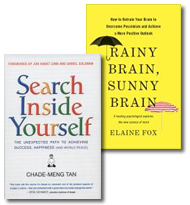 In Search Inside Yourself, Chade-Meng Tan briefly cites many of the same brain studies discussed in Elaine Fox’s Rainy Brain, Sunny Brain. Tan’s book is the more pragmatic of the two, with numerous exercises and examples designed to develop inner strengths that contribute to the reader’s sense of well being and happiness. Tan explains that enhancing our ability to pay attention can improve how we respond to our emotions, and he begins by training readers in mindful attention. After readers have deepened the calmness and clarity of the mind, Fox then trains readers to recognize their physical reactions to emotions. These skills are foundational to the emotional intelligence that leads to successful work, meaningful relationships and true happiness. Chade-Meng Tan is one of Google’s earliest engineers, responsible for the team that monitored Google’s search quality. His current job description at Google is to “enlighten minds, open hearts, create world peace.” He first designed Search Inside Yourself for a course he teaches at Google to enhance productivity and creativity, to make work more meaningful and to experience fulfillment in life. Both of these books are well worth reading. Recommended. Gosford Park–Written by Downton Abbey scribe, Julian Fellows, this film is a murder mystery set at an English country estate. The upstairs/downstairs class division present even inthe 1930s facilitates director Robert Altman’s penchant for overlapping dialogue and numerous subplots. This Academy Award winner won Best Original Screenplay and features an all-star cast including Helen Mirren, Maggie Smith, Emily Watson and Kristin Scott Thomas. Bleak House–Not a movie, but a Masterpiece Theater production, this miniseries features Charles Dance (Game of Thrones, Lord Tywin Lannister) and Gillian Anderson in Dickens’ indictment of the Victorian legal system. Plot twists, a murder mystery and an infamous inheritance are at the center of this multi-character epic. Death at a Funeral–Featuring a key role by another Game of Thrones favorite, Peter Dinklage (Tyrion Lannister), this drawing room comedy features plenty of sight gags. At the funeral of the family patriarch things get off to a bad start when the wrong corpse is delivered, and things go downhill from there. A far funnier film than the American remake. The Fuqua Book Exchange is taking place now through May 15th. Donate your gently-used books to other students, staff, faculty and the library. Fiction is accepted for this event. It is bring a book, take a book. Free! Drop off your book donations at the Ford Circulation Desk. Books for exchange will be housed in a special book shelf in the Career section at the back of the library. Any unclaimed or leftover at the end of the event will be donated to Better World Books http://www.betterworldbooks.com (CFO, Paul Sansone, Fuqua Alumnus, 1992) or the Durham Public Library. Smith, Greg. Why I Left Goldman Sachs : a Wall Street Story. Grand Central Publishing, 2012. In summer 2012, 13 Fuqua students, including 7 interns, began their careers at Goldman Sachs. Congratulations to these students for securing a place in the world’s most prestigious bank. At the same time, it is too bad that these students began their internships and permanent appointments several months before Greg Smith’s book Why I Left Goldman Sachs was published. It is regrettable because Smith’s book, a chronicle of his 12 years at Goldman 2000-12, is a day-to-day account of what it is like to be hired and to work at the investment bank. While the book was not written to be a useful introduction, it achieves that purpose admirably. Smith begins his book as an intern at Open Meeting at Goldman. Open Meeting is a boot camp for summer interns in the sales and trading program and Smith shows the reader how to navigate them successfully, to impress the partners and to secure an offer for a permanent position. In addition, Smith details specific steps to cultivate relationships with mentors or “rabbis” so an intern can convert the summer internship into a permanent position. He describes the firm, and its organization, processes and protocols. And he offers strategies for negotiating the company, all with a level of detail that would be most helpful to anyone beginning their career at Goldman. Much of the book is written as a memoir. Smith was a 1st year analyst on 9/11/2001, taking a qualifying exam in Midtown when he learned about the twin towers. During his first year, he describes his first trade, his relationships with coworkers, managers and partners, and later the market meltdown in 2008. Brilliant, focused and competitive, he works hard and for long hours. He is promoted several times until he is Vice President, head of the U.S. equity derivatives business in Europe. Yet ultimately, this is a story of disillusionment. He writes that somewhere between 2000 and 2012, the firm lost its way. When he begins his internship in 2000, he is convinced that the culture of Goldman Sachs is one of truthfulness, resourcefulness and collaboration — one acts in the best interest of the client. By the end, he understands that the firm is only facilitating trades between large institutional investors, generating optimum profits for the partners and harming the global financial system in the process. There has been a backlash against this book even though it is well written and it rings true. This may result from the manner in which Smith reveals his accomplishments. He competed on the South African team at the Maccabiah Games at age 14, which he calls “one of the five largest sports gatherings in the world.” He earned a full scholarship to Stanford University as an international student from South Africa and lets readers know that only 1% of international students who apply are offered those scholarships. He tells us that only 2.2% of undergraduates who apply for summer internships at Goldman get an offer, and only 40% of interns are offered permanent positions at Goldman for the following year. This style of writing is somewhat off-putting. Nonetheless, this book is clearly written and provides information useful to students interested in careers on Wall Street, especially the 15 or so Fuqua students who have accepted offers from Goldman Sachs. A quick and easy read, this book is also accessible to others interested in the dealings on Wall Street. Smith is the author of the notable NYT article of the same name that appeared on March 14, 2012 and drew millions of responses worldwide. Welcome to the Spring 2013 installment of Ford Library Director, Meg Trauner’s selections of five recent business books recommended to readers at the Fuqua School of Business. Bailout : an inside account of how Washington abandoned main street while rescuing Wall Street. by Neil M. Barofsky. The lawyer responsible for oversight of TARP funds explains how federal officials gave away $700 billion to Wall Street bankers instead of mortgage holders and business owners. Read the full review here. Exposure : inside the Olympus scandal : how I went from CEO to whistleblower by Michael Woodford. The CEO of Olympus discovers a fraud and cover-up at his Japanese multinational, blows the whistle on his own company and flees the country for his life. How Will You Measure Your Life? by Clayton M. Christensen et al. Harvard professor Christensen applies business principles to the challenges of students’ career and personal lives. Read the full review here. The power of habit : why we do what we do in life and business by Charles Duhigg. A New York Times business reporter describes how habits are created and changed in individuals and within organizations. Read the full review here. The price of inequality : how today’s divided society endangers our future by Joseph E. Stiglitz. Stiglitz, a Nobel laureate (Economics) argues that the level of inequality in the United States is excessive, reducing economic growth and eroding opportunities for young people. Read the full review here. Also available as an audiobook. Coates, John. The hour between dog and wolf : risk-taking, gut feelings and the biology of boom and bust. Penguin Press, 2012. In recent years, there have been a number of books published that explain how market participants make decisions and why risk takers make errors. The name of this discipline is behavioral finance. Among the best works is a new book, The Hour Between Dog and Wolf, written by a former trader at Goldman Sachs and Deutsche Bank, who quit his job, earned a doctorate in neuroscience from Cambridge University and began to research the biology of financial risk taking. John Coates begins his book by explaining that high-stakes risk taking triggers strong emotions and biological reactions in financial traders. On a day when traders make millions, they become arrogant and egotistical. When they lose millions, they become paralyzed, mentally replaying their mistakes. While there is no real physical risk in financial trading, their bodies experience the same physical changes that enabled our ancestors to fight an enemy or flee from a predator. Coates describes these physical changes and why they happen, including the effect of hormones, particularly steroids such as testosterone and cortisol that have profound effect on thinking and behavior. Coates explains that when traders make money, they experience a surge in testosterone that results in overconfidence, impulsiveness and excess risk taking. When traders lose money, they experience a surge in the steroid cortisol that promotes feelings of anxiety and fear. Coates hypothesizes that during bull markets, testosterone rises among participants, which leads to bubbles. During bear markets, cortisol rises, encouraging sell offs, and eventually creating crashes. He believes that the financial community develops chronically elevated steroid levels that profoundly effect market behavior. Using anecdotes and examples from his own personal experience as a trader, Coates shows that rational decision making on Wall Street is overshadowed by primitive drives. Coates relates how the brain and body work together and discusses the role of gut thinking. Near the end of the book, he offers solutions to the emotional boom and bust, including changes to the incentive structure, mandatory vacations for traders and workforce diversification, as women and older men have less testosterone. This thought provoking book is entertaining to the end. Our recent survey revealed that you are interested in reading popular business titles and career books on an e-reader. However, many of you mentioned that you also do not currently own an e-reader. 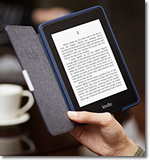 We have the solution: Kindles can now be checked out from the Ford Library! We currently have two sets of Kindle titles available: Business Best Sellers and Career Books. A new category of Kindle titles, Business Classics, is coming soon. To find out more information about this project, please visit our Kindle Project webpage. If you would like to see a particular title available on our Kindles, you can request it by following the “Suggest a Title” link on the webpage. Questions and feedback about the Kindle Project, as well as the Library in general, are welcome. We hope you enjoy this terrific new addition to the Ford Library’s collection!